You can find some additional great Ramirez cartoons here, here, and here. Almost two years ago, I wrote that bailing out Greece was misguided because it would dig the debt hole deeper. More recently, I wrote an I-told-you-so post that looked at my four original predictions and patted myself on the back for being accurate (not that it took any special insight to conclude that bailouts would make things worse). But now it’s time for a turbo-charged I-told-you-so post. The UK-based Telegraph has a remarkable story about the chaos in Europe. This passage is a good summary of the circular firing squad. Just when the eurozone governments thought it could not get worse for Europe’s single currency, it did.Shell-shocked EU finance ministers meeting in Brussels on Saturday were already reeling from the worst Franco-German rift for over 20 years and a fractious failure to resolve the problems that have brought Greece, and the euro, close to the brink.But then a new bombshell hit as a joint report by the EU and the International Monetary Fund (IMF) warned that, without a default, the Greek debt crisis alone could swallow the eurozone’s entire €440 billion bailout fund – leaving nothing to spare to help the affected banks of Italy, Spain or France. And to understand how the situation is so dire, here are some additional details. Compounding the trauma, Christine Lagarde, the French finance minister turned IMF chief – and one of the few key players who appeared to be enjoying herself in her new headmistress-like role – issued a grim warning to her former European peers. The IMF would no longer be willing to pick up a third of the total bill for rescuing Greece, a contribution worth €73 billion, unless European banks were prepared to write off 50 per cent of Greek debt. “It was grim. The worst mood I have ever seen, a complete mess,” said one eurozone finance minister. But here’s the key passage of the entire article, where the German Finance Minister correctly complains that the crisis is now three times as costly thanks to previous bailouts. According to insiders, Wolfgang Schaeuble, Germany’s finance minister, could not resist taking an “I told you so” approach – he had been, after all, the first to call for an “orderly” default for Greece 18 months ago, at a time when the cost of such a move was less than one third of the price today. “Schaeuble is a man who does not mince his words, whose reputation for harshness and arrogance is well earned. He was, frankly, unbearable,” said one diplomat. This is similar to the point I made in my post about whether the bailouts would work. But as I noted above, there was nothing profound about my predictions. Sort of like predicting water runs downhill. The amusing part of the story is the infighting among Europe’s politicians. Interpersonal relations between eurozone leaders have hit an all-time low, reflecting sharp disagreements between Germany and France over using the ECB to bailout the euro and presenting an additional obstacle to finding a “grand solution” to Europe’s debt crisis. Nicolas Sarkozy’s “two faced” personality has been cited as a major factor in his dysfunctional relationship with Angela Merkel. …A row between the pair in Frankfurt on Wednesday overshadowed leaving-do celebrations to mark the end of Jean-Claude Trichet’s nine years as the head of the ECB. “Their shouting could be heard down the corridor in the concert hall where an orchestra was about to play the EU’s anthem, Ode to Joy,” said an incredulous EU official. And the depressing part of the story is how one of the chief Euro-crats is trying to use the crisis as an excuse for more centralization in Brussels. Herman Van Rompuy, the EU president who is regarded by many as too close to Berlin, angered many countries when he made confidential proposals for the creation of a European finance ministry. His plan, which has considerable backing from the growing body of EU bureaucrats who see a unified EU treasury as the only solution to the problem of countries spending more than the euro can stand, would mean a centralised body able to override national budgets and enforce cuts on profligate governments. I doubt this terrible idea will be approved, but the final outcome won’t be pleasant. The worst-case scenario is that American taxpayers somehow will get suckered into participating in a bailout. 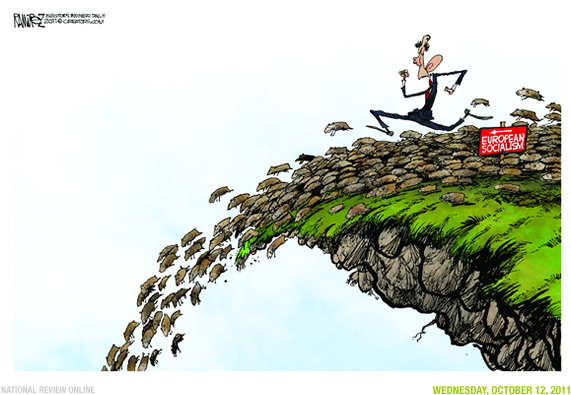 The Senate has voted against subsidizing the failure of European socialism, but Obama has said he wants American taxpayers to participate in a bailout and the White House may use the Fed or some back-door mechanism to unilaterally link America to Europe’s sinking ship.